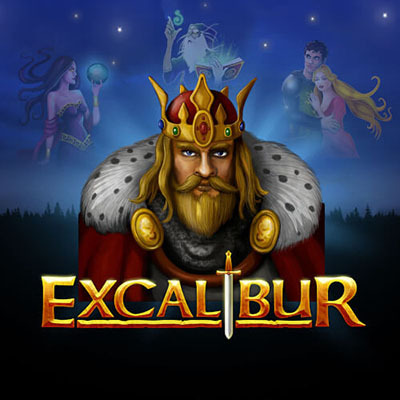 Excalibur by NetEnt is a 5 reel20 payline slot based on the legendary King Arthur. We’ve heard this story before told over several different versions and now we have a slot dedicated to this powerful figure. In this slot, we’re doing more than honouring the King- we’re also paying homage to his magical sword, Excalibur. The game’s got basic, but sharp graphics and smooth animations. If you’re a fan of this legend, you’re going to spot familiar characters on the reels like Merlin, friends of King Arthur like Sir Lancelot,Morgan,Guinevere, Mordred and the mysterious Lady of the Lake.Stakes start from 20p to £80 per spin. NetEnt has come along way since their 1996 debut.Today they’re the most popular online slot developer, managing to compete and win against Novomatic, IGT andMicrogaming. NetEnt slots are popular in the UK, Europe and the Nordics. They’re also looking to expand into USA territory. The company abides by strict safety standards and always avoid any legal issues, although their games meet the highest betting standards in all the regions they operate. In 2016, NetEnt started putting up land based betting shops in the UK. This move was geared toward reaching more of their audiences who prefer fixed odds betting terminals. The highest paying symbols include thegolden chalice and the Excalibur. 5 of the previous multiply your stake by 500, 4 give a 25x multiplier, 3 chalices mean 5x your stake and 2 double your stake. 5 Excalibur swords award 1,000xyour stake. You can form a win with just 2 number 10 symbols, but all the other symbols need 3 you’d need identical ones to form a winning combination. The minimum amount you can bet is 20p per spin, and the highest is £80 per spin. Wild symbol- The Excalibur sword is the wild symbol. It can replaceall the symbols to form wins and awards a double multiplier. The Excalibur sword cannot replace any scatters or golden Excalibur wilds. When several Excalibur wildsland on an active payline, theyform winning combinations but the payouts aren’t multiplied. Scatter symbol- The gold chalice is the scatter. It doesn’t need toland on an activate payline to form a win. The scatter can form part of winning combinations anywhere on the reels, as long as two of them are already there. Multiplythe scatter symbol winning combination payout and your total coin bet and the resulting value is your winnings. Free spins- Free Spins aretriggered when you hit 3 or more scatters anywhere on the reels in the base game. All payouts during free spins are tripled.Land anywhere between 3 to 5 and win different number of free spins with the highest being 30.Extra free spinsare won when you land more scatters, but thewins won’t havea 3x multiplier. During the bonus, wins on active pay lines resultingfrom wild and golden wild icons go through 2 multipliers; the free spins multiplier and thewild multiplier. The second wild- the golden Excalibur, appears only on the 3rdreel, replaces all normal symbolsand has a 4x multiplier for your win.Only one golden wild 4x multiplier will be applied to your bet line win if both types of wilds appear on a winning line. The Excalibur slot has a medium variance. The most money can be made during the free spin bonus.The wild multipliers are the highlight of the game. Players can win up to 1,500x your stake during free spins, so get to spinning if you are a fan of this story.